Have you ever made an unnecessary, hasty promise you were sorry about afterwards but had to keep? Always remember: God honors us when we keep our promises. [Shouting loudly and angrily:] "JEPHTHAH! JEPHTHAH!" Jephthah was lying peacefully in his room when the loud, unfriendly yelling of familiar voices outside his door jolted him awake from his deep sleep. Jumping to his feet onto the cold, dirt floor, he quickly grabbed his sword as the unwelcome shouting continued. "Jephthah, come outside immediately! We need to talk to you!" As he opened the door, Jephthah stared into the angry faces of his brothers. Actually, they were his half-brothers. "Jephthah," they threatened, "you think that just because you're the oldest son of our father, Gilead, you'll inherit his possessions. Well, we have news for you. You will NOT! And we will make SURE of that! You're an illegitimate child because your mother is not married to our father. You have no right to our inheritance! We're giving you a chance to flee or this will be the end of you!" 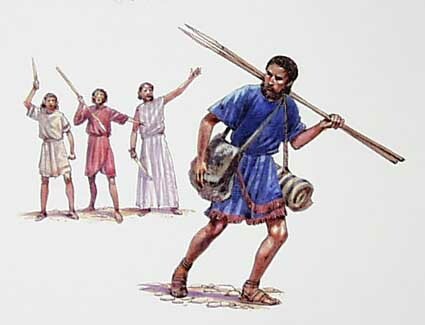 Outnumbered by his brothers, Jephthah didn't want to quarrel with them, so he carefully bolted the door behind him, shoved a few belongings into a bag and then fled from his brothers to the land of Tob. Determined not to let the sin of his father ruin his life or cause him to pity himself, Jephthah put all his energy into becoming a brave hero, skillful with the sword. A gang of scoundrels noticed how good he was with the sword and decided to join him. He became their leader and led them on raids, reaching beyond the borders of Israel. For 18 years of Jephthah's life, Israel found themselves in dire straits, brought upon themselves for doing wrong in the eyes of the Lord. They had forsaken the Holy One of Israel and gone their own way, serving idols, which were an abomination in the sight of God. The Lord became so angry with Israel that He no longer protected them against heathen nations, such as the Philistines and the Ammonites. During this time, the Ammonites marched across the Jordan River to come, fight against the children of Israel at Mizpah in Gilead. The Israelites were in great distress and extremely afraid when they heard enemy armies were coming to fight them. 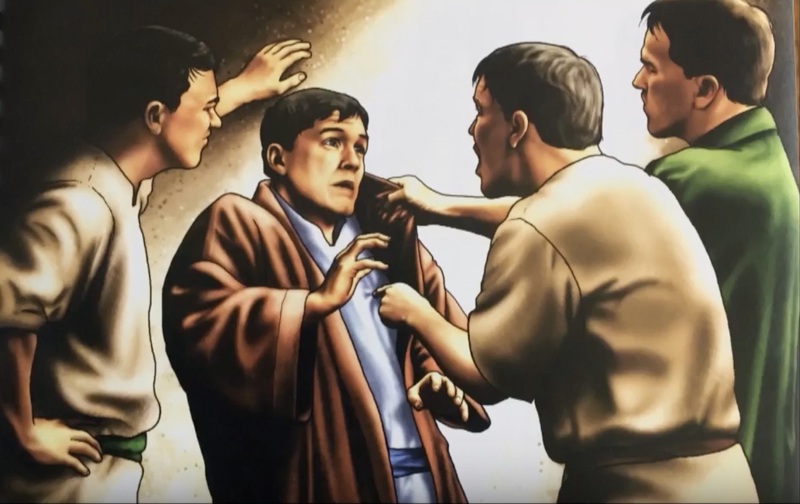 Trembling — their skin crawling with terror — they humbled themselves before God, falling with their faces to the ground, and cried out with bitter tears of repentance, "We have sinned against You, oh Lord, by serving other gods. We beg You to forgive us. Please have mercy on us and save us!" But the Lord would hear none of it. "Why do you bother to come to Me and ask for help? Go, ask those idols you love so much! You don't want to serve ONLY Me, as I have commanded, so why must I help you? I have helped you countless times before and still you choose to serve your dead and worthless idols." In desperation, the children of Israel cried, "Lord, You can punish us any way You wish but please rescue us now!" Then the whole Hebrew nation got rid of every idol in their midst and served only the Lord. Seeing their commitment, the Lord had mercy on them. He had compassion on them because of their misery, and He began stirring up hearts to set a plan in place, to save Israel from the Ammonites. So the elders of Gilead came together. "Who will lead our forces against the Ammonites?" they asked each other. "Whoever volunteers must be our leader." They reasoned back and forth until one wise, old man said, "Let's go, ask that mighty warrior Jephthah. He's skillful with a sword and he knows how to do battle. Let him be our leader." Everyone agreed so a company of elders were sent to the land of Tob to fetch Jephthah. "Jephthah, Jephthah! Please come, help us fight against the Ammonites!" they begged him. "Why do you come to me?" Jephthah asked. "You hate me! You have driven me out of my father's house. Why do you ask me for help when you are in trouble?" "Please listen. We really need a great warrior like you to lead us in battle against the Ammonites. We promise, with a solemn oath before the Lord, that if you will be our commander-in-chief against them, we will also make you leader of all the people of Gilead." Having faith that this was the Lord's doing, Jephthah listened and followed them to Mizpah. There in Mizpah, everything that was promised to Jephthah was repeated before the Lord and all the people. So Jephthah became their commander-in-chief and leader of Gilead. Before going to battle, Jephthah's first strategy was to try and reason with the King of Ammon. He sent messengers to him, wanting to know why the Ammonites were planning to attack the Israelites living in the land of Gilead. The King of Ammon replied that Israel had stolen this land and he wanted it back peaceably. "First of all, King of Ammon, Gilead was never the King of Ammon's land to begin with because Israel took it from the AmoRites, not the AmmoNites. "Secondly, King of Ammon, it was the Lord our God Who gave the land of Gilead to us. "Thirdly, King of Ammon, for 300 years since it became Israel's land, not one person contested our ownership of Gilead." He added, "I have not sinned against you, King of Ammon, but you have done me wrong to come, fight against me. Soon our Lord God, the one true and righteous Judge, will come, show which of us is right — Israel or Ammon." But the King of Ammon paid no attention to Jephthah's message. Instead, he prepared his troops for war. "Lord, if You will let Israel conquer the Ammonites, then when we return home in peace, the first thing, coming out the door of my house to meet me, will belong to You. Or if nothing comes to meet me, I will sacrifice a burnt offering to You!" 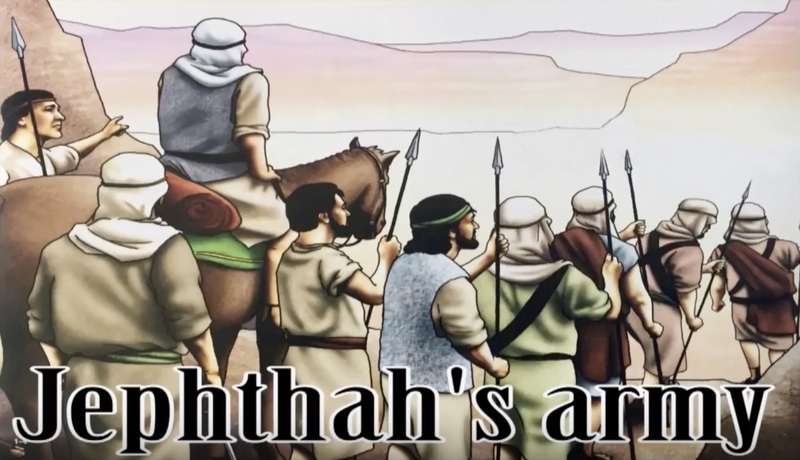 Commander-in-Chief Jephthah and his army marched against the Ammonites, and the Lord led them to a huge victory over their enemies, helping them conquer twenty cities, reaching far and wide across the land. And that is the story of how the Israelites subdued Ammon. 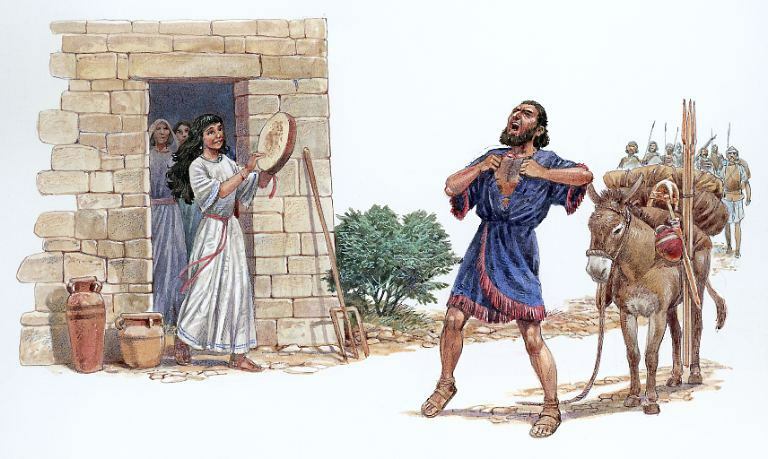 When Jephthah returned triumphantly to his home in Mizpah, who should come out to meet him but his daughter — his only child — dancing joyfully, playing the tambourine to welcome him. When he saw her, he tore his clothes in anguish and wept bitterly, crying out, "Oh, my daughter! You bring me great sorrow. I am devastated because I have made a vow to the Lord, and I cannot take it back!" Jephthah knew what that meant. His only daughter had to be sent away, completely consecrated to the service of the Lord in the tabernacle. Never would she be able to marry or have children, meaning Jephthah would never have grandchildren or any descendants, something of utmost importance in Israel's culture. But Jephthah's daughter, being just as honest and upright as himself, answered, "Father, you must do whatever you promised the Lord, for He has given you great victory over your enemies. But, first, do me a favor. Let me go up into the mountains with my girlfriends for two months to weep and mourn, because I will never marry and never be able to have a child." So he granted her request and sent her into the mountains with her female companions. After two months, she bravely returned home. Keeping his promise, Jephthah consecrated her solely to the Lord, according to his vow, and she never did marry. And so it became a custom that young women of Israel put aside four days each year to remember the consecration of the daughter of Jephthah, the Gileadite. In the Book of Hebrews, Jephthah is mentioned as a great hero of faith. Because he sacrificed his own earthly future to keep his vow to the Lord and, in keeping his promise, he secured his eternal future in heaven, by faith. Dear young one, you can be a great hero of faith too. Be brave, be honest, be true to your word and have faith, because God loves you and has a great plan for your life and wants you to spend eternity in heaven with Him! Always be true to your word. 1. Why did Jephthah's brothers chase him away? 2. Did Jephthah let his circumstances ruin his life? 3. 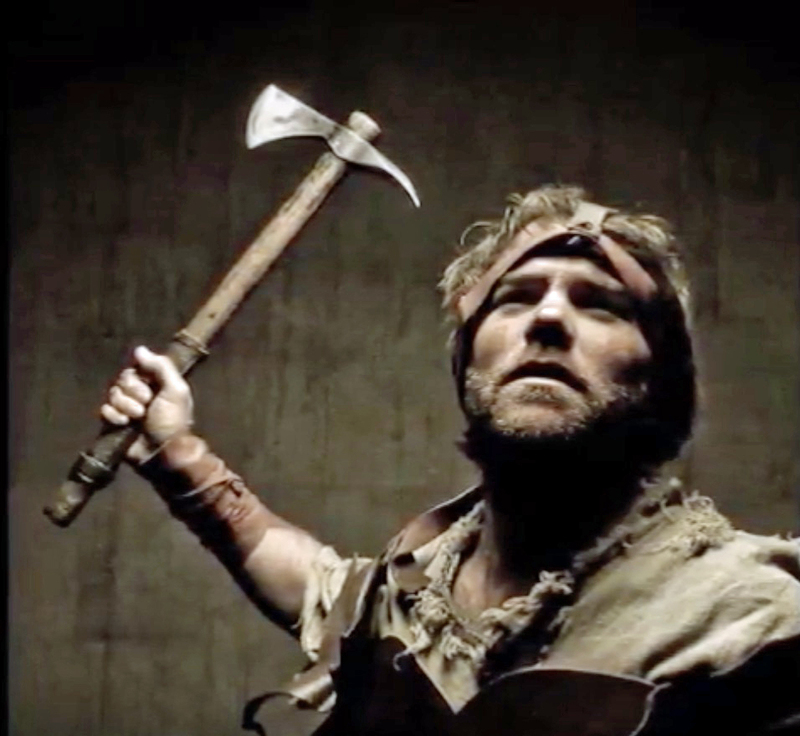 Do you think Jephthah forgave his brothers before he became the leader of Gilead? 4. Was Jephthah a man of his word? 5. Do you think Jephthah trusted his daughter to come back to him after two months in the mountains? 6. What does that say about his daughter? 7. Have you ever made a foolish promise? Did you keep it? "Lord, who shall abide in thy tabernacle? who shall dwell in thy holy hill?... He that sweareth to his own hurt, and changeth not" (Psalm 15:1,4). "Better is it that thou shouldest not vow, than that thou shouldest vow and not pay" (Ecclesiastes 5:5). and others. Keep me true to my word and to You. Give me power every hour to be true. In Jesus' Name. Amen.